I started thinking about Vancouver, BC as a future travel destination a little bit over two years ago. One day a casual chat with my former manager lead to sharing our “experiences on the road”. We touched everything from favorite places to the most dreadful journeys. Then all of a sudden, “You should visit Vancouver. It’s absolutely beautiful! It feels very much like the US. I love it so much!” made some invisible shift in my mind and stuck in the head. For two years, I was talking and dreaming about this bustling Canadian city. My love to it grew stronger and stronger. Finally, the day came when I stopped just wishing for the beautiful gem in British Columbia and instead together with my family jumped on a plane flying directly to Vancouver. We endured all these sweet “sacrifices” for the love to one of the most inspiring places. Everybody will find something enticing for himself or herself in this coastal city. And I’d like to share main reasons why I love Vancouver so much. Vancouver arguably belongs to the category of the most beautiful cities in the world. My curious nature would probably jump to all kind of questions regarding this statement. But then “Have you ever seen this gorgeous city?” silences these disturbing voices in my head and brings me back to reality. Vancouver is absolutely incredible! A city that you fall in love with the moment you see it. Any arguments are simply inappropriate here. The stunning pearl of British Columbia spreads all over the western half of the Burrard Peninsula neighboring to English Bay and the Burrard Inlet to the north. To the south, the Fraser River claims its rights to establish the boundaries of the city. North Sore Mountains don’t shy away from interrupting this water idyll and creating a dramatic backdrop for the place. 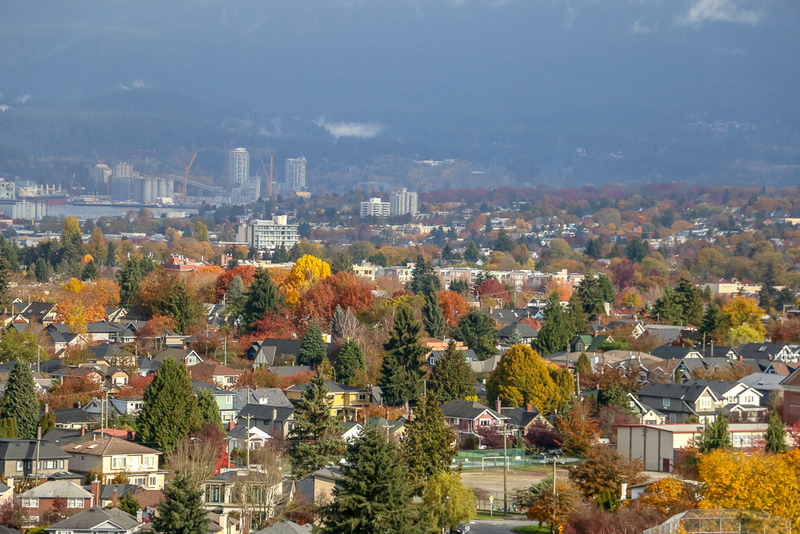 Vancouver is sunning in fall and winter when it rains and snows. But especially it’s delightful in spring and summer when the sun shines bright, reflecting in skyscrapers. This charming city in British Columbia is awe-inspiring from the top. It first showed itself to us from an airplane whirling high above in the sky. To a pilot’s voice announcing a soon-to-be landing, my husband and I hurriedly leaned over to the window. With high expectations, we stared at tiny islands. Slightly bigger isles with some signs of human presence followed their little siblings. Soon large pieces of land surrounded by water and finally a peninsular with city’s skyscrapers showed on the horizon. Oh, what a view! Such a lovely, dreamy place! But Vancouver is not limited to just the incredible vistas from the airplane windows. 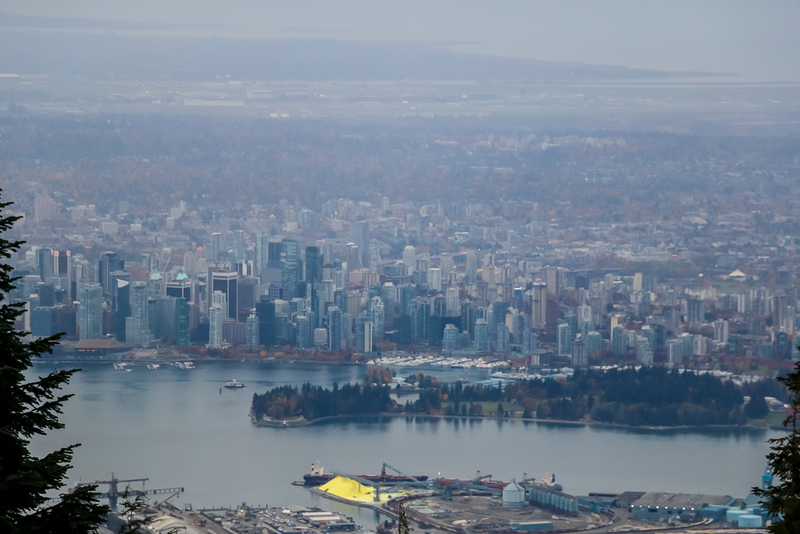 The views from the famous Vancouver Lookout are completely different, yet as incredible as the previous ones. They enable you to become an insider, an undivided part of the city, slowly rising over the magnificent buildings all the way to the top. At the upper level, from the viewing platform, the whole city unfolds in front of you. Here are the Lions Gate Bridge, Canada Place, incredibly huge Stanley Park occupying the whole peninsular within the city limits… How can’t you resist loving all these? Helicopter ride is yet another unique opportunity to admire Vancouver from the top. Not far behind stay the magnificent vistas from Skyride taking its passengers to Grouse Mountain and presenting the stunning pictures of the whole city along the way. “I love it so much!” flew out of my mouth probably dozen times within six minutes while the tram was slowly moving up. If you have time for only one thing to do in Vancouver, make sure to see this incredible coastal city in western Canada from above. Not big deal you might say. Most of the world has four seasons. But for someone who lives in ever-sunny California, yet almost never-changing Los Angeles, it really is of great importance. Such simple, common thing as the change of the seasons feels so intimate and special, and looks so good in Vancouver. We visited the city in fall. And it was absolutely beautiful with bountiful red, yellow, and orange fall colors throwing their bright hues everywhere. Now can you imagine the effect of such lovely change in weather conditions and environment on someone who never saw true fall with its vibrant foliage in real life? It’s unreal and mesmerizing! 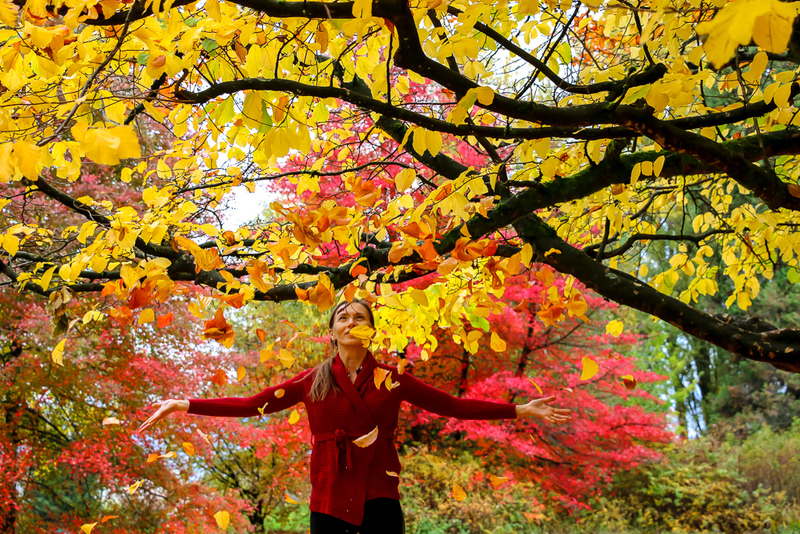 This is exactly what my husband felt playing with the colorful tree leaves for the first time. 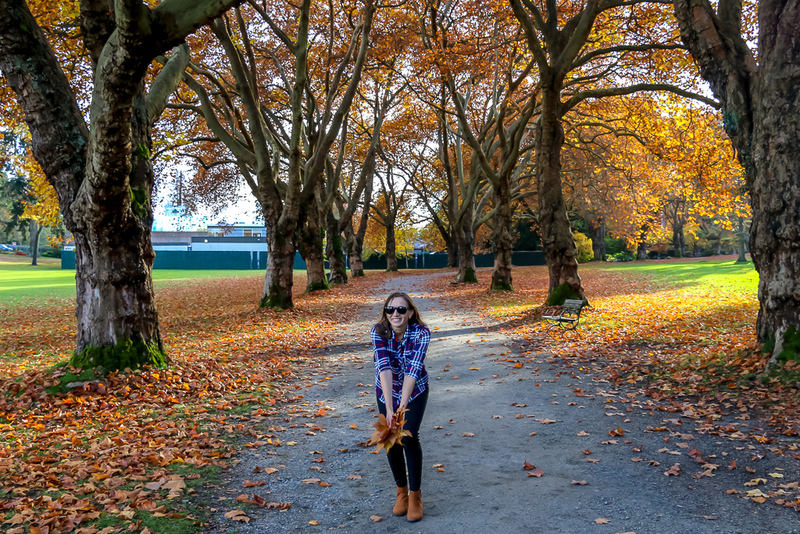 Vancouver’s golden fall charmed us, no doubts about it. Countless parks, numerous suburban alleys and streets reveal themselves in a new way in different seasons of the year. You can’t help but fall deeply and deeply in love with this city every single day. North America’s third largest park is a place you can’t miss in Vancouver. The 4.5-hectare public area is located near the downtown and is almost entirely surrounded by Vancouver Harbor and English Bay. 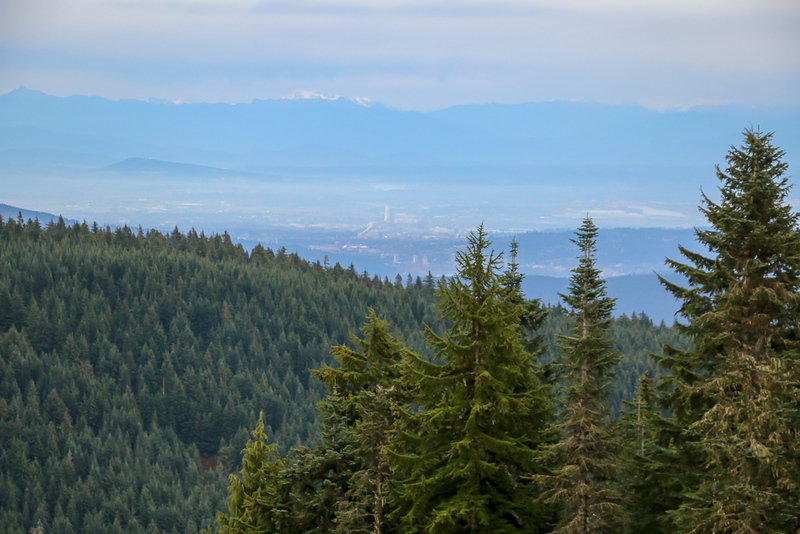 Every year eight million visitors come here to explore natural West Cost rainforest, enjoy scenic views over the city and mountains, and discover parks’ ample hiking trails. Local wildlife, cultural and historical landmarks, picturesque beaches, festivals and pumpkin patch, kid’s favorite place before Halloween, and even Canada’s largest aquarium – Stanley Park, you are unbelievable! And I can’t imagine Vancouver without you! 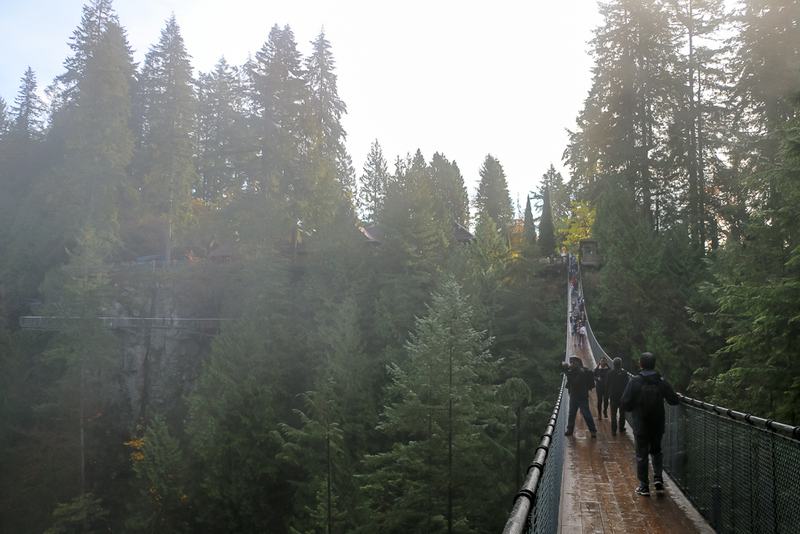 Capilano Suspension Bridge is a place the world, at least its northern part, is raving about. One of Vancouver’s most popular attractions is perhaps the first stop most of the visitors make during their stay in the city. I became obsessed with the Capilano Suspension Bridge about a year ago. On my quest of “places to see in Vancouver, Canada”, next to Stanley Park, Google showed a picture of a footbridge that seemed to try to escape the attention and hide in the depths of a dense forest. A real wobbly bridge! I knew right there that I absolutely had to see it. And indeed it was one of the first places we visited in Vancouver. And certainly it deserves its laurels as one of the city’s favorite landmarks, a place that makes it so hard not to love Vancouver. As its famous sight, the Capilano Suspension Bridge, the District of North Vancouver captivates with its beauty. 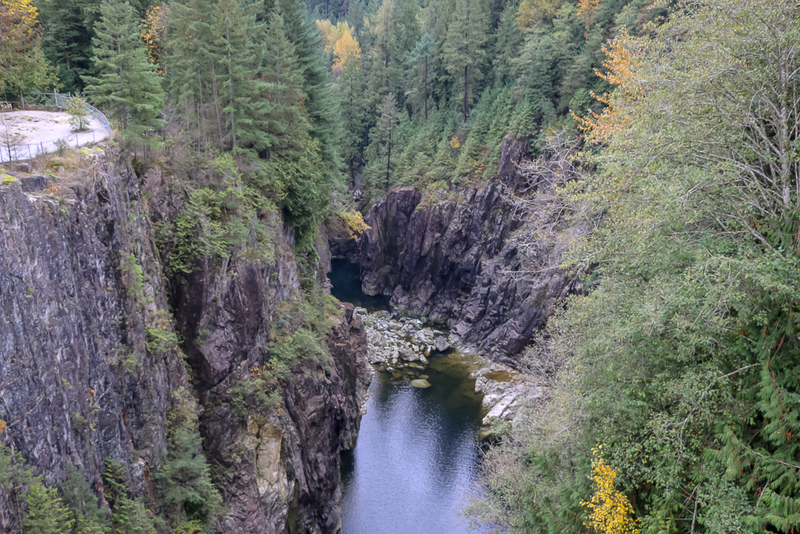 About 20 minutes drive from the center of Vancouver takes you from a bustling city to a place full of the tallest evergreen trees, mountains, waterfalls, tranquility, and feelings of love and gratitude overflowing your heart. North Vancouver is not just one more stop on your itinerary. It’s a place that leaves a big mark on you, a destination that is better to be seen once than to be heard about hundred times. Vancouver has no problems in accommodating any dietary restrictions. 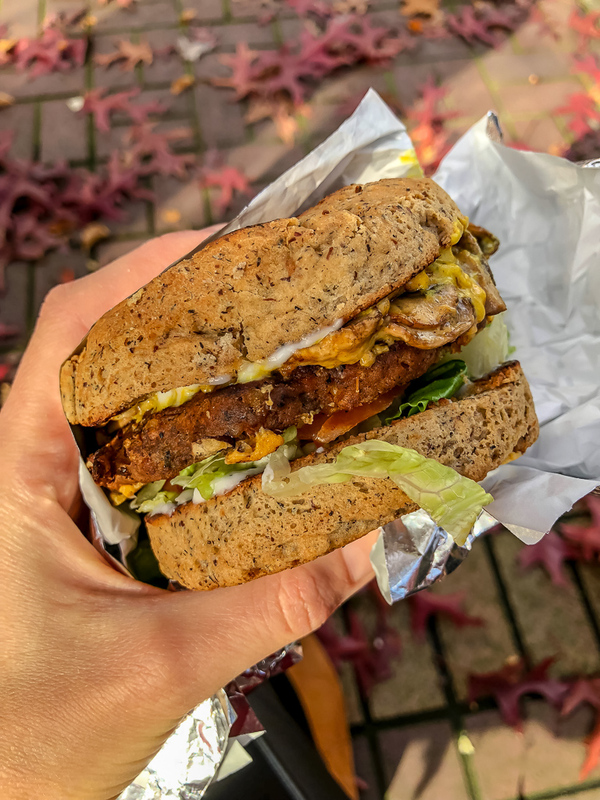 Whether you are vegan, vegetarian, pescatarian, or potato-and-meat-eater, you can always find not one but multiple restaurants, cafés, and food stands serving the most delicious meal of your choice. Remember those puzzled faces of waiters and cashiers looking oddly or in sympathy every time you ask for veggie sushi or soup cooked with water or vegetarian broth as opposed to chicken or beef broth? Guess what? You can finally say farewell to all of them. During our visit, I not once had to compromise with what I wanted to eat and what was served. Oh, how can’t you not love and adore this remarkable city with its great food choices? Let me be straightforward. I’m not a big fan of street food. Honestly, it always comes as my last choice. In Vancouver though, the old preferences were placed aside. “What will you eat?” – asked my husband as we were driving in the downtown area. “Anything vegan,” – my reply was quicker than I could think. Yelp came in handy. One option got my attention right away. Vegan sandwiches from “Loving Hut Express” with one $ next to them look very appealing on a picture. Reviews also suggested that those were the best vegan goodies in the city. Little did we know that Loving Hut Express was a street food vendor located near dock in Yaletown. Great (or not so great)… But the parking was paid, and we were hungry. Thus, this vegan spot received our orders in no time. Approximately 15 minutes later, we finally got our hands on the food. I could swear that was the best street food I had ever tried up to that point. I loved it, and so did my husband who, by the way, is very picky when it comes to food. His theory is: “When you pay for the food, it’s gotta to be good.” The man is definitely right. And Vancouver got everything right with the best vegan street food. 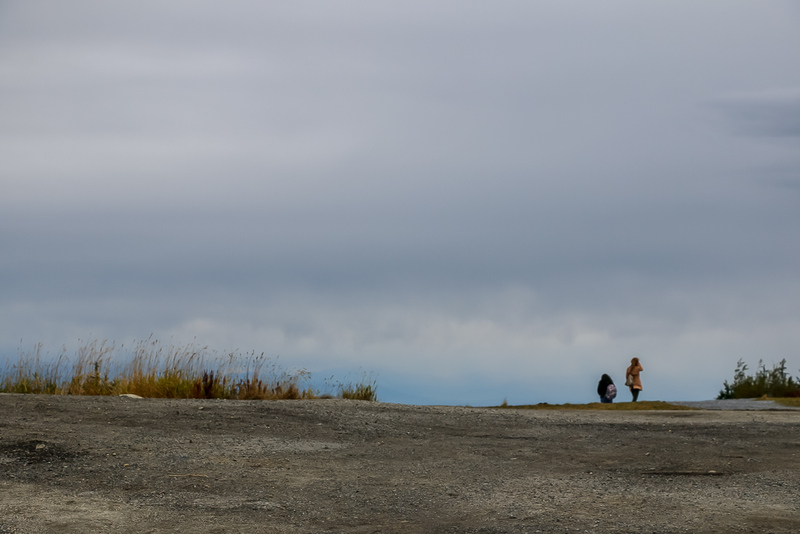 Despite common sense, I loved overcast weather in Vancouver. Its chilly mornings, and windy evenings were so lovely. I enjoyed sitting outside, breathing in fresh air, and sipping hot chocolate – something that I normally don’t do, especially a hot, sweet beverage from the nearest café. Even a cup of hotel’s black tea tasted so much better accompanied by the sound of heavy rain pouring outside the window. In Vancouver, the cold weather and hot beverages are inseparable. They harmoniously complement each other. This is what you would call, a match made in heaven. View from Grouse Maintain. Vancouver is beautiful at any season. When in Canada, you ought to try its maple syrup. Even though Quebec is a primary producer of this signature liquid that goes so well with warm pancakes, Vancouver doesn’t suffer from its shortage. Like any true Canadian cities, it has more than enough of maple syrup to satisfy tons of its devoted fans. You, too, absolutely must give yourself a sweet break and indulge in this traditional treat at least once, or twice, or as long as your trip lasts. Isn’t it, what we call, love from the first spoon?